A nice small trip to Iru, first time ever. The weather was amazingly nice, just like the nature. 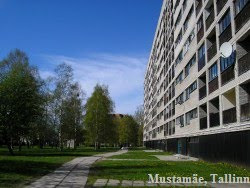 It is part of Lasnamäe, although quite a different part, and separated from the main buildings' area. One of the "main" buildings in Iru is the house for taking care of elderly people. Here it is. Looks like built in 1995 or little later. But there are other houses too. I suspect this house used to be the forerunner before the current much bigger house of this institution. Because it looks too big for such a remote location. But who knows. Their homepage doesn't have any historical information. Local power plant. This is another object why the name Iru is well known.